This latest bag has been a true challenge for me. I started it before Christmas last year and was determined to finish it. But I was not expecting the amount of time and energy it would take for every single row. I first saw this pattern here through Ravelry and fell in love with the chevrons. The technique described on how to get the chevron look was new to me. So I did my homework on how best to do a “tapestry crochet“. 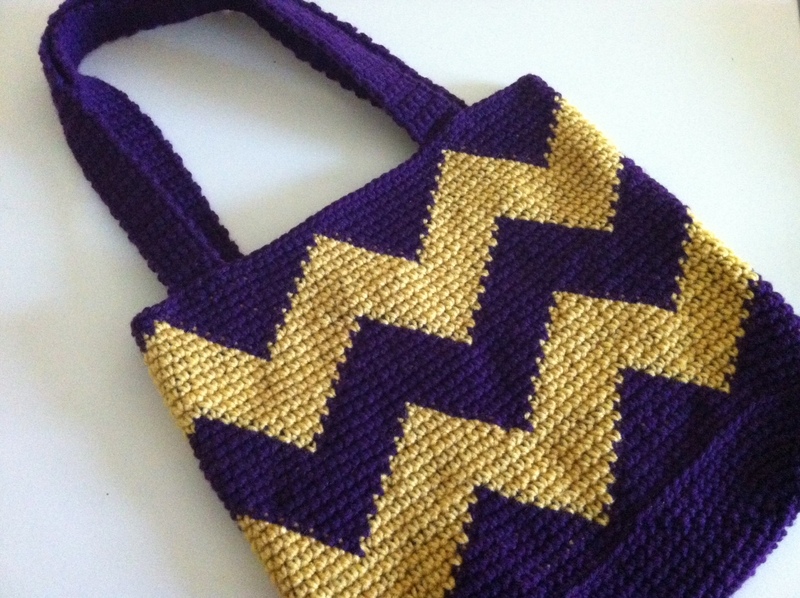 Here is the original tote and a link to Yogahound’s Blog. You’ve probably seen it floating around on Pinterest. I wanted to make a smaller and more oval version of this bag. 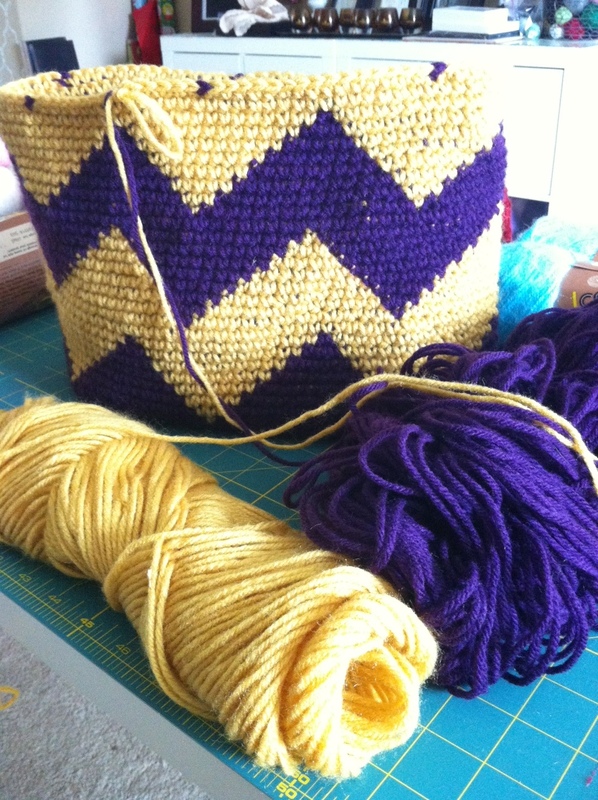 I hit my yarn stash for possible color combinations and settled on purple and gold. I followed the graphed pattern for the chevrons provided in the original pattern. It was simple but very time-consuming and almost tedious at times. This is definitely a good WIP project to pick up every now and then. This is how this project sat for several weeks. Almost mocking me…. haunting me with the fact it was unfinished for so long. The other day I tackled it once again and didn’t put it down until it was done. The purple is a difficult to photograph but I promise it looks gorgeous! 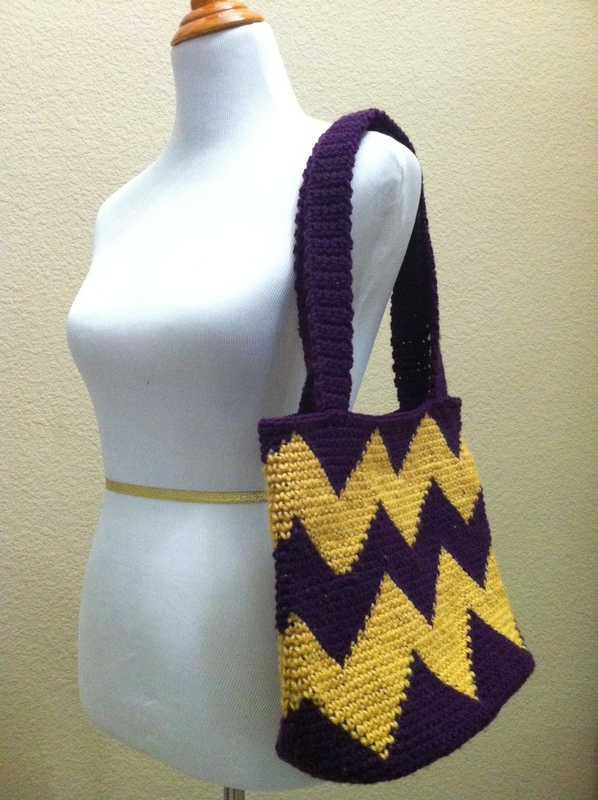 Love the blue and gold chevron bag. I’m going to have to look up how to do the chevrons. I’m thinking ill do one with garden twine and a contrasting cotton. Would you be willing to share your modifications to the original pattern? Of course I will share! I plan to start another tote and will be taking detailed photos of the process. The biggest difference between mine and the original pattern is the oval bottom. I would love to know how you did the bottom of your bag. thank you for your help. Hi! The bottom of the bag was done in a single crochet, oval. Unfortunately I dont have photos of the process but it was a very simple oval shape that has 3 stitch increases on each side of the oval and worked in the round until the desired size of the bottom is achieved. Hope that gives you an idea!